Today is World Pangolin Day! And given my fondness for armoured animals, I would be remiss in not sharing at least a little bit of information about pangolins today. I think it’s a shame that many people have never heard about pangolins. It’s weird they don’t show up in more kids books about mammals and animals in general – I recall my first encounter with them was in a high school biology textbook, where there was a little two-tone illustration of one on a page about mammal diversity. Who knew there were scaly mammals? Imagine my delight when I found out that the zoology collection at the University of Alberta included a pangolin skin (and mounted skeleton!). Pangolins really look like giant walking pinecones. Their hairs are modified into tough, overlapping scales. They have massively strong arms and claws, which they use to rip open termite mounds (at least for ground pangolins). This makes their genus name, Manis (hand) appropriate, although I’m surprised they weren’t named after their scales! 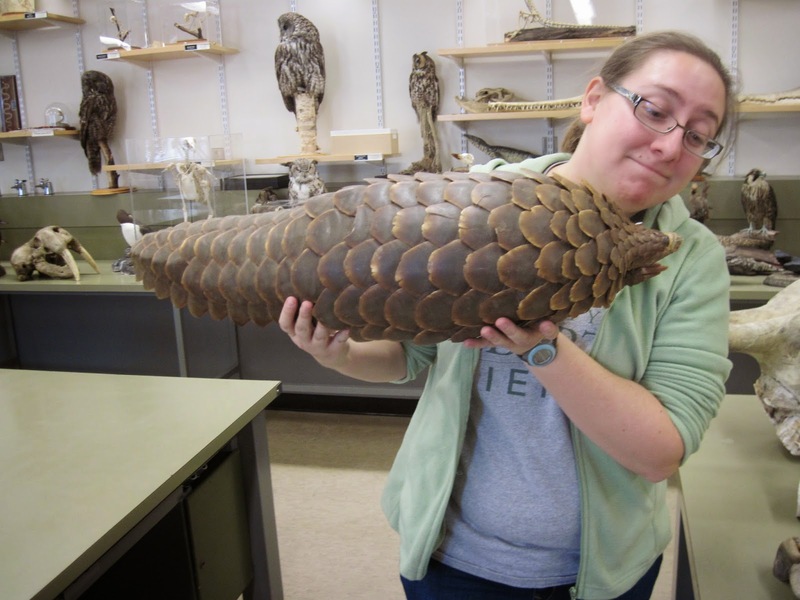 The pinecone pangolin I’m holding is either a ground pangolin or a giant pangolin, but there are also tree pangolins that climb and have prehensile tails. In total, there are 4 species of pangolin in Africa and 4 in Asia. Pangolins are the closest mammalian analogues to dinosaurs I think we’ve got – ground pangolins walk on their hind feet with their tail stretched out behind them, and tuck their front legs up, maybe using them to balance occasionally as they trundle along. (In a sense, they walk like we do when we’re pretending to be velociraptors. This is a thing other people do, right?) They can also roll up into a ball. They are basically the best animal ever. They are pretty neat little creatures, but their populations are at risk due to habitat loss, the bushmeat trade, and the pet trade. I would dearly love to see a living pangolin during my lifetime.